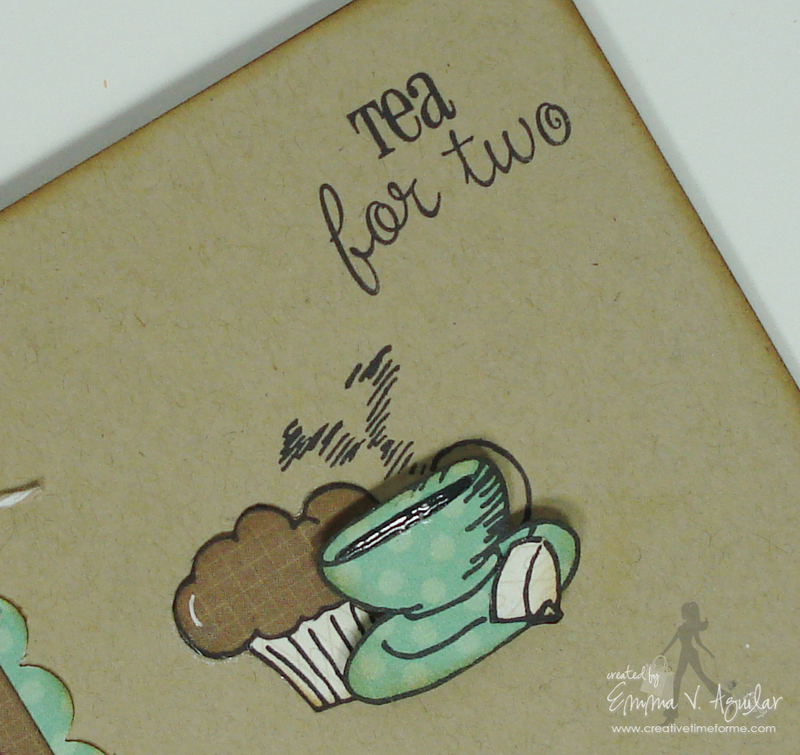 My Creative Time: Tea for two! GOOD MORNING! Like I promised, another SUPER DUPER CUTE sneaky peek for you! ;) Like I said a few times this week, this is my absolute FAVORITE release to date! It is filled w/a little something for everyone! As much as I LOVE my Hot Chocolate & my Coffee, I enjoy having my tea from time to time! Especially at night while I am crafting , because I don't want to have caffeine an hour before I go to bed either! So I always make sure my tea is decaf! I am SO HAPPY w/how my card turned out today! As you can see, I am on a "Kraft Cardstock" mission! lol..... I chose to showcase this release using the Kraft color because I know alot of you are really not into coloring! So I wanted to show you how simple these stamps can be used w/o coloring them! For today's card, I actually stamped these 2 images a few times onto my new Echo Park pattern pattern, then cut out the images w/some nice sharp scissors! So I basically paper pieced this together! I hope I made Scrappin Navy Wife proud! ;) hehehe! Emma, this is super cute! Drinking tea should be made LAW!! Ha Ha!! MUCH more refreshing than coffee. Good morning Miss Emma! this set is becoming MY new favorite as well! Cant wait to see it in its entirety. Can I place my order now? lol.... My favorite so far is Freshly brewed just for you that was posted yesterday. LOVE this!! great job paper piecing as well. I havent tried that one quite yet. I love this card, I really should try paper piecing the stamps, I am trying to get into coloring thought but until then I will give the paper piecing a try. I also forgot to let you know that I got my stamps 6 days after I ordered them (which was the same day they were released) that is a record since I live in Canada!!! Thanks so much!! OMG, another ADORABLE card! I LOVE the color scheme you've been using! This is just precious!!! Eeek - I can tell this is going to be a must have set!!! LOVING everything I have seen you make with it this week!!! Wonderful job on the stamping & paper piecing. There's a challenge that closes in 16 hrs today 3/8 you can enter this in: Chocolate Coffee Cards Ch 7 Drink Up image needs to have a beverage on it which yours does. OMG Emma!! I am so in love with this! So excited to see the whole release...all these sneaks look amazing! Your paper piecing is fabulous!!! I am loving loving loving this new stamp set!!! I can't wait until it is released so I can order it!!! So Cute. Great Job Paper Piercing my friend. adorable card Emma as always! So far, I love everything I've seen! But them I always do. Great card Emma!! Adorable card Emma! I love all of them! You do such an awesome job! I am already in love with them! You should do pre orders cause i would get mine now! You are super woman Emma! I forgot to tell you how beautiful your card is you did a fabulous job. Im not good with scissors but you did a perfect job! I have to get some... Where can I order them from? Oh Dear Emma, I so love this set. My hubby is going to get me. LOL I have to have this one. I said this month would be my month to not buy but we will see. I think your card turn our great with the paper pricing. AJ! Good Morning! Not sure I'm in the right place, but I'll give it a go. Veronica directed me to your blog for a chance to win one of your new stamp sets. So here I am. Love your card and your stamp sets are totally awesome!!!!! I'd love to win some. HMMMM - my favorite so far is ALL of them! I am going to have a late night waiting to order these new ones. Emma ~ This is just BEAUTIFUL! I LOVE how you showed us that you DON'T have to color and make it look so FANTASTIC! EXCELLENT paper piecing! The sneaks look AMAZING all week! I also enjoy tea every once in awhile too! As always LOVE it! Ahhhhhhh... you are killing me with these sneaks! WOW!! What a adorable card!! Three cute cards can't wait to see all the new stamps. I really love this card, plus all the others you have done this week too! I love this stamp, since I do not do coffee. Can't wait to see the rest of your release. These sneak peaks just kept getting better and better!! lol I love this card, so cute! 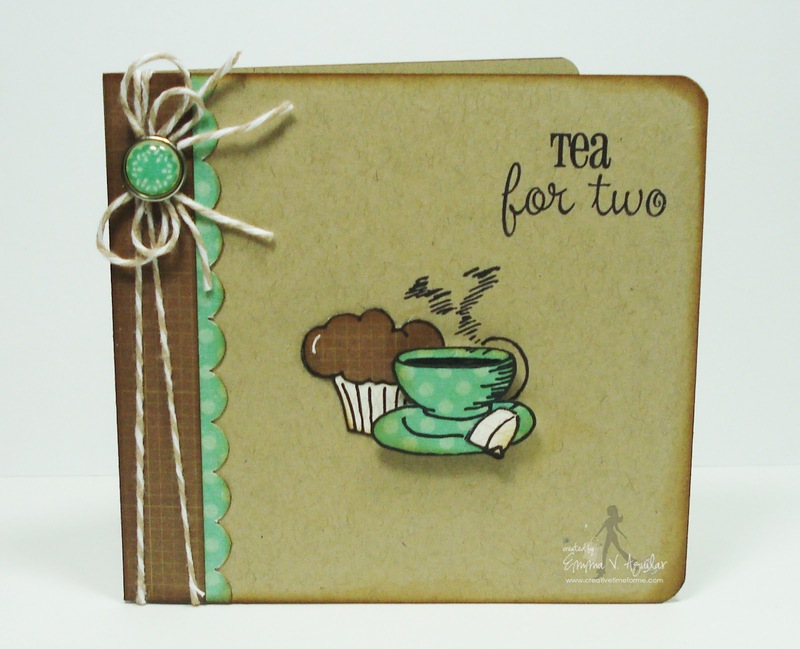 I also love the kraft colored bases for the cards, so love kraft card stock!! As always you do a super duper job Miss Emma and you always have me wishing for extra money to buy all your stamps and dies!!! lol But until I have all the money I want I will just have to pick and choose and slowly build my library of your stamps and dies. What a SUPER CUTE card! I love every sneaky peek card...especially Wednesdays Freshly Brewed Just for You with the adorable take-out coffee cup :) (my favorite everyday beverage). I'm excited to see the entire March release! Your stamps are the BEST! Awesome! I cannot wait to see this release. 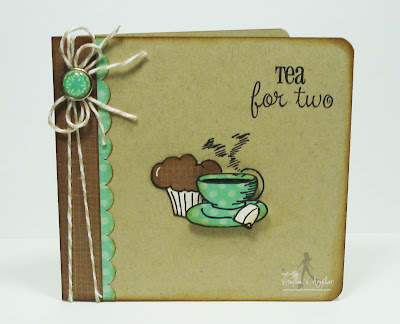 I like the tea card best so far, but probably just because I don't like coffee. I know, I am strange. LOL Thanks so much for sharing. It really looks great. Omg! There so cute! Oh I would get so much use from this series! Very inspiring! Mmmmm it makes ya thirty! I don't have many stamps but I'd get a whole lot of use out of these. TFS $ for a chance to win! Cute release. I know about having morning coffee, even if decalf. Super cute release! I love your stamps! very cute card. makes me wish i owned those two carts - and those great stamps too. thanks for the chance to win. What a cute card and love the "Love you a Latte" card. This set so reminds me of my sister-in-law, the coffee fanatic. Thanks for a truly great offering. Love seeing all of the wonderful things these stamps can do! You do such great work!! I have just gotten started in paper crafts and cards this year. I hope to one day create cards as beautiful as yours. Emma that card actually reminds me of a good date night invite for my hubby lol. I love it and you are so creative. Thanks for all the inspiration. Simply charming! Adorable tea "set"!